Maria Qamar, otherwise known as Hatecopy (@Hatecopy), is an artist living in Toronto. She was raised a first generation Canadian in a traditional South Asian home where a job in the arts was typically looked down upon as an “unstable career path.” Soon after realizing there was no other option, she fought to pursue the arts anyway and started her Instagram account Hatecopy in February 2015, illustrating the hilarious insights of diaspora culture and the significance of aunties in Indian culture. 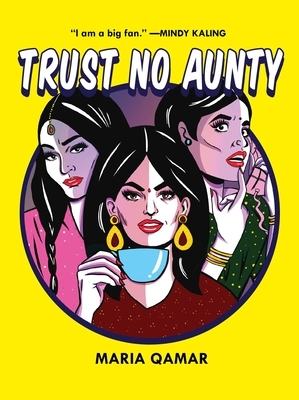 Trust No Aunty is her first book. "When I first saw [Qamar's] work, I was instantly drawn to her ability to combine whimsy with cultural criticism. . . . Hatecopy is hilarious, smart, and insightful, speaking both to particular South Asian experiences and broader issues of self-acceptance and celebrating your identity as a person of color." "[A] hilarious survival guide. . . . Through her work, Qamar strives to create a space for South Asian women in the diaspora that is all their own." "Hilarious, tongue-in-cheek advice. . . . As a self-professed 'aunty-survivor,' Qamar combines her striking illustrations with tips on how to navigate the drama aunties inevitably bring into our lives."